Jewellery is always an excellent gift idea for every occasion. A precious accessory will put a twinkle in their eye. But it’s important to choose jewellery for a loved one with care: it’s not always easy to find an accessory that reflects their tastes, is meaningful, and is long-lasting and of high quality. With our jewellery collections dedicated to men, women and children we try to create accessories that match each person’s style and personality so everyone can tell their story, their most important moments and their passions. All Nomination jewellery designed for you is made from top quality materials: stainless steel, sterling silver, yellow and rose gold, coloured gemstones and leather combine to create accessories with a modern design. Discover all the Nomination bracelets, rings, necklaces and other accessories which are the perfect gift for a special occasion. Discover all the Jewellery dedicated to Mum! Are you hoping to surprise a loved one on a special occasion? We’ve got some tips for you. The most original gift idea there is is to create unique jewellery designed specifically for the person it’s intended for. 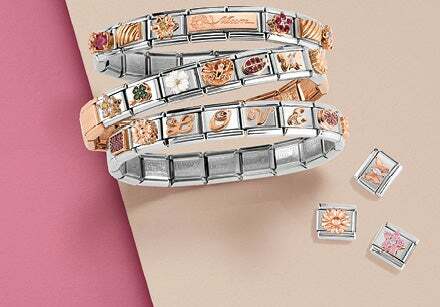 This is possible with Composable bracelets: no piece can ever be identical to another because you personalise it with the Links and charms you want. The bracelet becomes a really meaningful gift that will make them feel truly important. Choose it as a gift for men, women or kids: our vast collection of precious Links includes symbols, engravings and pendants to dedicate to a special person on every occasion. Words count, especially when inscribed forever onto metal. What better way to share our message with someone special than by engraving it onto jewellery? Our selection of jewellery that’s customisable with an inscription was specifically designed so you can express your feelings in a unique way. A gift idea for him? 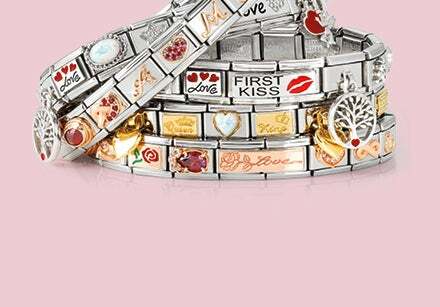 A bracelet, a pendant necklace or a key chain: each of these precious accessories can be engraved on the back, forever commemorating your sweet words, a date, a memory. For her there are stretch bracelets with an engravable gold plaque. And then there are Composable Links which are perfect for both him and her: made with sterling silver and yellow and rose gold, the Classic and Double Links were designed to add an even more original touch to the Composable bracelet. On which occasions can you give Nomination jewellery? On every occasion! In addition to the more classic collections, you will find jewellery designed specifically to be given in the most special moments of life. There are bracelets and necklaces that celebrate important moments in the lives of children, such as baptism, confirmation or First Communion, and also those dedicated to a major event such as graduation, which is a very important milestone for many boys and girls. And there’s lots of romantic jewellery dedicated to him and her which makes the perfect gift on occasions like anniversaries, weddings, and birthdays.